“No other painter has travelled back and forth across this country as Jackson did, never faltering in his lifelong quest to express on canvas the beauty and grandeur of Canada’s wilderness and the simple charm of its small towns. Throughout his travels – from the fishing villages of Nova Scotia and snow-covered farmland of lower Quebec to the frozen Arctic and native settlements of British Columbia – Jackson got to know such a diverse cross section of the Canadian population that he could have written several books. Instead he chose to show the many different parts of this country in his vivid paintings,” wrote Wayne Larsen. In 1930 A.Y. 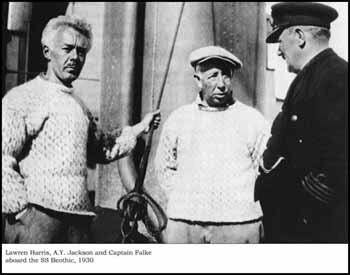 Jackson visited the Arctic with Lawren Harris. It was Jackson’s third trip and Harris’s first. Jackson had already been to this frozen region of Canada in 1927 and 1928 with Dr. Frederick Banting. These were extremely productive trips, and work from them had been shown at The Art Gallery of Toronto (now the Art Gallery of Ontario) and was well covered by the press. This would spur Harris, who was extremely interested in austere landscapes, to accept Jackson’s 1930 invitation. “My heart’s in the Arctic, my heart is not here,” wrote Jackson as he was preparing for the trip. Aboard the supply ship SS Beothic, the artists steamed through Davis Strait and would venture as far north as the Kane Basin, with numerous stops planned along the way. Successful landings at port depended entirely on the weather, which was intermittently foul, and pack ice often thwarted their plans. Sketching days on shore were cherished, and between Jackson’s autobiography and his known sketches, we find that they spent most of their onshore time at Pangnirtung, as the SS Beothic was delivering building supplies for a hospital there, and in Greenland at Godhavn. They also stopped at Framhavn on Ellesmere Island, Pim Island, Nerck and Coburg Island, and broke through the ever-encroaching pack ice in Bathurst Inlet and Lancaster Sound before its hull-crushing dangers turned them back. If we consider Jackson’s designation of this work as having come from the Eastern Arctic, we can presume that this work depicts a spot in either Greenland or at Pangnirtung, where his writings tell us they had clear weather, and descriptions fit the scenery. At Pangnirtung he wrote, “The settlement consisted of the usual white painted wooden buildings and the colourful Eskimo igloos and tents made of skins and old sails stuck anywhere. There were husky dogs and boulders all over the place. It would have made a fine setting for a play at Hart House if anyone had ever written one with such a background.” He also relates that he “climbed to the top of a high hill and made drawings of the mountains on Pangnirtung Fiord. What a country it was! Lakes, hills, upper grassy meadows, snow-capped mountains. The last time I visited it, fog obscured all.” Encampment, Eastern Arctic certainly seems to fit this description. The igloo shelter is made of skins anchored with boulders, and the tent is either canvas or old sails. The placement of the figures and their boat reminds us of Jackson’s Quebec works wherein red-jacketed figures drive sleighs. Here and there children lean against a fence. Jackson speaks frequently of the huskies in his Arctic writings, and his inclusion of the sled dogs – which were everywhere, including on the SS Beothic – seems fitting. The clean, sweeping lines of the distant mountains, perhaps the very ones he describes in the foregoing quoted passage, are a slight nod to his sketching companion Harris, and rendered in contrasting shades of earthy umber brown and pearly glacial white. His affection for this place, despite the difficulties of travel there, is clear in this fine work. Jackson used a 1930 graphite drawing as the source material for this vivid Arctic canvas, as well as the oil sketch Eastern Arctic, now in a private collection. Both are rare glimpses into the trips he took there. 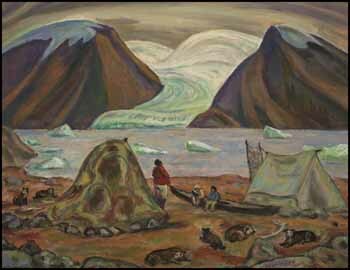 It is rather remarkable to realize that on his journeys he sketched the remains of the Franklin expeditions, drew the camps of nomadic hunters who lived in skin tents, and saw the first telephone poles to be erected on Baffin Island. As with all of Jackson’s work, Encampment, Eastern Arctic is a significant monument to our diverse and varied Canadian history.